Meanwhile, I have another book review for you. 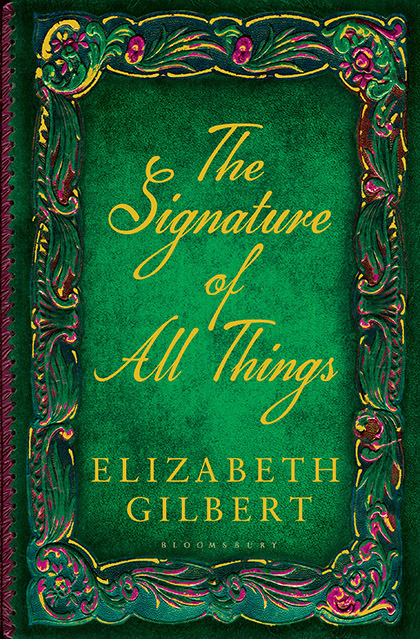 I wanted to read Elizabeth Gilbert‘s The Signature of All Things since I first laid eyes on the UK edition and its synopsis. That was about a month before the publication in October. So I had to wait patiently. I told myself that I’d see how much money I’d need in Frankfurt and that I’d buy the book afterwards. But I didn’t need to. At my interview with Thérèse Coen from Bloomsbury we also talked about The Signature of All Things. And after our interview, she asked me if I already had a copy. Well, I didn’t have one, so she gave one to me! I was the happiest girl ever. That totally made my day! The surprise came about three hours later on the bus ride home. I had time to leaf through the book and only then noticed that the book was signed! You can probably imagine my face! 😀 Thank you so much Thérèse! Well, even without the signature, this book would be a gem. This edition is so beautiful. I’m in love with it. At the beginning of a new century, Alma Whittaker is born into a perfect Philadelphia winter. Her father, Henry Whittaker, is a bold and charismatic botanical explorer whose vast fortune belies his lowly beginnings as a vagrant in Sir Joseph Banks’s Kew Gardens and as a deck hand on Captain Cook’s HMS Resolution. Alma’s mother, a strict woman from an esteemed Dutch family, has a knowledge of botany equal to any man’s. It is not long before Alma, an independent girl with a thirst for knowledge, comes into her own within the world of plants and science. But as her careful studies of moss take her deeper into the mysteries of evolution, the man she comes to love draws her in the opposite direction. The Signature of All Things is a big novel, about a big century. It soars across the globe from London, to Peru, to Philadelphia, to Tahiti, to Amsterdam. Peopled with extraordinary characters – missionaries, abolitionists, adventurers, astronomers, sea captains, geniuses and the quite mad –above all it has an unforgettable heroine in Alma Whittaker, a woman of the Enlightened Age who stands defiantly on the cusp of the modern. The Signature of All Things is mainly set in the 19th century. Its numerous settings include places in Europe, North America and French Polynesia. Even though I have never visited most of the book’s settings, I was able to visualize all of them and Ms. Gilbert’s descriptions are great because when I googled one of the settings, it looked exactly like I imagined it. The main character, Alma Whittaker, grows up to be a reasonable, intelligent, extremely well-read and well-taught woman. It is remarkable to see the world through her eyes. Alma grows up in a wealthy household and still lives a life so different to other wealthy young women. I felt how uncomfortable she felt in regard to having friends and doing things that didn’t fulfil any purpose. I also relaxed when Alma relaxed, sitting at the table, being surrounded by scholars and scientists. The secondary characters in The Signature of All Things are beautifully crafted. Each has their own story to tell and would be interesting enough to write a novel about. The book’s plot spans Alma’s, plus a quick version of her father’s life. It is very detailed. You will learn much about botany (but I guess you figured that by reading the synopsis) but there are also long conversations about spirituality. Even though I really liked the overall story, The Signature of All Things has many passages that felt drawn-out. It was as if everything written had to stay in the book. My reading pace was an interplay of quick and slow. Nevertheless, I think you should read this book if you like the synopsis. The Signature of All Things might be drawn-out at times, but it is also absorbing, surprising, adventurous and different.